Finance Minister Bill Morneau is continuing to pull and pluck away at his government’s controversial tax regime proposals, promising now to adjust the rules on passive income so only three per cent of the “most wealthy” privately owned corporations will have to pay higher taxes. Morneau announced the latest tweak to his proposed tax changes at a cafe in Hampton, N.B., a small community east of the Saint John riding held by Liberal MP Wayne Long, who was reprimanded earlier this month for protesting the government’s moves. Morneau said the system will now allow $50,000 of passive investment income annually to be sheltered before the higher tax rate is imposed. His department also said that all past investments and the income earned from those investments would be protected. The government describes passive investment income as the investment of money left in a corporation, for purposes other than to invest directly in growth. It includes earnings owners derive from inside their private corporations, through things like real estate, dividends or investments. Morneau said Wednesday the changes would allow small business owners to put money away for retirement and parental leave, while making it less attractive for wealthy individuals to use private corporations to hold large tax-deferred investments. To emphasize the point, Morneau made the announcement in a cafe, surrounded by several female entrepreneurs and flanked by Status of Women Minister Maryam Monsef. “By providing a window so they can continue to have money inside their business, we’re creating the opportunity for people to continue to save, to continue to be able to have their retirement taken care of,” he said. The tweak to Morneau’s original proposal comes after an onslaught of complaints that warned cracking down on passive investments could hurt middle-class entrepreneurs who use their companies to save for economic downturns, sick leaves and parental leaves. However, the finance minister said there’s between $200 billion and $300 billion in assets sitting in the passive investment accounts of just two per cent of all private corporations — or about 29,000 companies out of 1.8 million private corporations. Morneau met privately beforehand with about 10 people, including Jason Stephen, the former president of the N.B. Progressive Conservatives. “We have people arguing exactly how we should move forward, and we need to listen,” he said. Wednesday’s announcement is part of a week-long Liberal effort to calm the anger surrounding the tax proposals, which have outraged entrepreneurs, doctors, tax professionals, farmers and Liberal backbench MPs. Earlier this week Prime Minister Justin Trudeau promised to cut the small business tax rate to nine per cent by 2019 and announced plans to abandon a portion of the changes dealing with the intergenerational transfer of family businesses, including farms. The government is still moving ahead with limiting “income sprinkling.” Trudeau said the change is aimed at limiting the ability of business owners to lower their personal income taxes by sprinkling their income to family members who do not contribute to their companies. While Morneau was in New Brunswick, his personal financial affairs continued to get a beating in Ottawa, after a report from the Globe and Mail Monday that the finance minister hadn’t put his assets into a blind trust. The NDP has sent a letter to Dawson asking for a formal investigation, arguing there’s evidence Morneau is profiting from decisions he’s made in cabinet, particularly as sponsor of Bill C-27, which deals with target pension plans. His family business, Morneau Shepell, is a human resources and pension management company. 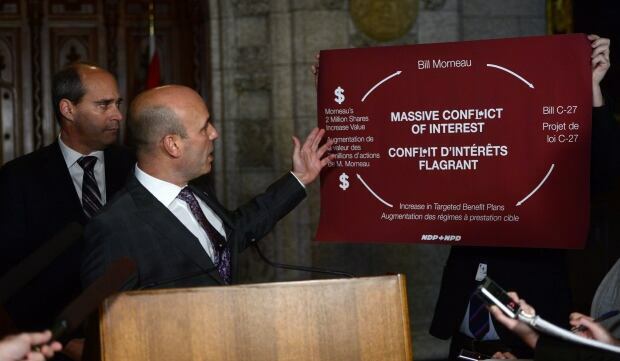 “We have government that is in a complete free fall with respect to their moral authority with a minister of finance who has clearly missed a basic requirement that all Canadians expect. All Canadians expect that at a minimum level that a minister should be in a position to make decisions that are not going to be in their own interest,” said NDP Leader Jagmeet Singh. On Tuesday, Morneau wrote to Dawson asking for another meeting. “Should you determine that additional measures — such as a blind trust — would be an appropriate course of action, I would be pleased and eager to move forward on any revised recommendations you might provide,” Morneau wrote.